Sheet music from Pentakill II & more, plus a deep-dive into making music with unorthodox instruments. Hi everyone, Alex “Scherzo” Temple here from the Riot music team. We’re here today with a second batch of League of Legends sheet music, plus a deep-dive into how we use found instruments in our music development endeavors! While sheet music represents some of the more typical work we do as composers, using found instruments represents the more unorthodox—this is when we use everyday objects as instruments or repurpose instruments to be played in a drastically different manner than intended. As composers, we’re fortunate to sit near Riot’s sound designers and share information back-and-forth with them. Sound designers record source material from a lot of objects and materials that would probably surprise the casual observer. Lots of other composers and musicians use found objects as instruments, but I think our frequent exposure to the way League’s sound designers work inspires us to look for unexpected sound sources more than we might otherwise. We have hundreds of preset sounds available to us on our virtual instruments and have access to some phenomenal musicians in Los Angeles, so why would we go out of our way to try to make unmusical objects sound musical, or to use a musical instrument in a way it wasn’t designed? For example, let’s take a look at the drums we used for Ekko’s champion teaser. When we first started working on Ekko’s music, we wondered what drum kits would sound like in Zaun, or what their equivalent would be. We figured that the musically-inclined denizens of Zaun would be creative and resourceful, but that they wouldn’t have access to really great-sounding instruments. They would have to funnel their musicality through instruments made out of salvaged scrap, or even through using non-musical objects as instruments. For us, this meant it was time for a field trip to the hardware store across the street. I can’t imagine what the staff at the store thought as I walked around tapping every metal or plastic object that looked like it might have interesting resonant characteristics. We ended up walking out with the makings of a percussion kit that included a 20-gallon trash can, a spool of copper wire, some metal springs, a tire iron, and a coat-hanger. 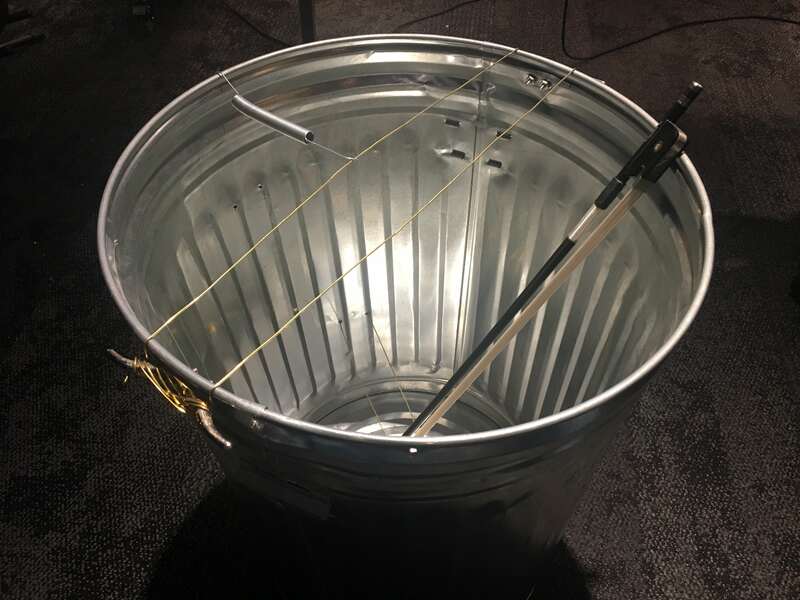 After drilling a few holes through the side of the trash can, running the copper wires through it, and removing the rattly handles, we had ourselves an instrument that could be plucked, bowed, struck, or dropped to create all sorts of crazy percussive and semi-tonal sounds. We recorded ourselves doing all of the above, and then chopped up our recording into individual sounds that could be triggered by a MIDI keyboard, turning our trash can into a virtual instrument that we could insert into our project alongside any of our commercial sample libraries. We ultimately found that our trash can percussion lacked the visceral gut-punch we wanted from our drums, and ended up using a hybrid kit that contained elements from both our found percussion and from some of our industrial drum sample libraries. Still, there’s enough of a sonic fingerprint from our instrument that its absence would be noticeable. Another reason we might explore unusual sounds is when we want something that sounds vaguely familiar, but that has been re-used in a much different musical context than what you would normally hear the instrument in. For one example, we can look at ambient pads, which are essentially long tones that usually have slow attacks and releases, giving us the perception that they slowly fade in and out without having clearly defined note beginnings and endings. Their lack of rhythmic clarity makes them very useful for setting a mood that conveys musical information but doesn’t commit to a melody. They can also be used to provide harmonic support or add textural background interest. Let’s take a look at one of the ambient pads I created for Ivern’s champion teaser. I wanted pads that sounded peaceful and “of the forest,” but I didn’t want them to sound synthetic. Synth pads often sound too clean, and I wanted something that fulfilled the same musical function but had enough sonic imperfections and inconsistencies to sound like it had a real-world source. 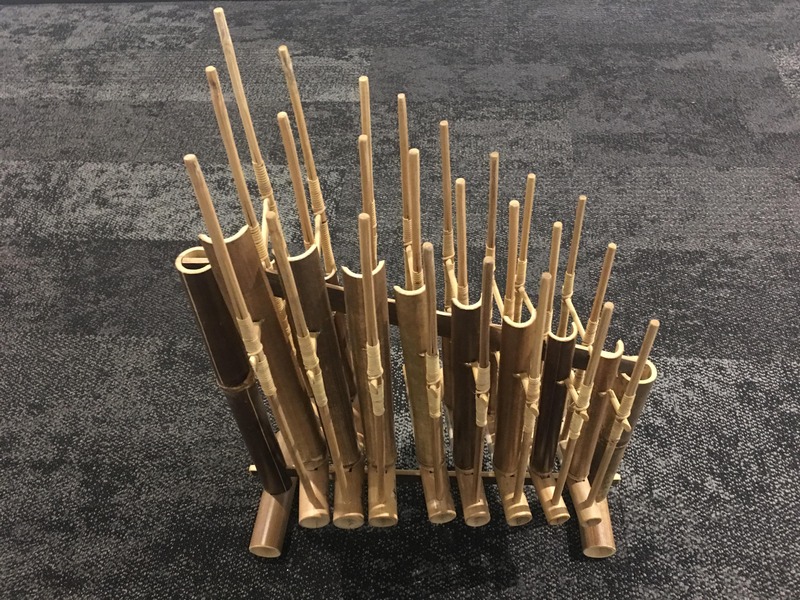 One of our composers had an angklung sitting in his room that a friend had given to him after a trip to Indonesia. An angklung is a wooden instrument made up of hollow bamboo tubes suspended from a wooden frame, which can be played by holding the frame with one hand and gently shaking the tubes with the other. I liked the wooden sound of this particular instrument and I thought it seemed thematically appropriate for the character, but without any proper technique on the instrument, it was hard to get sounds out of it without hearing bumpy rattling from the tubes I wasn’t playing. However, I found that by layering several recordings of individual tubes together, stretching out the audio for some layers, and running everything through a highly-resonant reverb, the bumpiness of the original recordings gave way to a more smeared, shimmery effect. This preserved a lot of what I liked about the sound while transforming it into a highly usable musical pad. I don’t think I could have ever achieved this effect with commercial angklung virtual instruments. As well-recorded as those might be, they would be much too precisely played to achieve the effect I was going for. When working with found instruments, the final result often lies somewhere between the high concept and the obvious approach. Sometimes the high concept, once fully realized, can be too alienating. It may lack familiar elements for a listener to latch onto, or it might just not sound good. But we’d like to think it gives us results that feel more specific to our subject than if we were to begin with our standard set of instruments and add in a “flavor” instrument as a final step. When we do find that our initial concept is too experimental, we often find that bringing back a little bit of familiarity—such as a drum kit to Ekko—goes a long way towards giving our specialty instruments a place to add a unique flair to a piece of music. And with that, we hope you enjoy perusing the scores below! As Ed the Conqueror explained in our first sheet music release, these are the raw scores we used at our recording sessions and may contain shorthand, errors, and ideas that were eventually cut or changed. This was a fun piece to record. We recorded strings and winds together and then did brass separately later on the same day. Normally the best practice for doing these “striped” sessions, as we call them, is to create a fixed tempo map beforehand that generates a click that the musicians play to. This ensures that when we combine our separately recorded ensembles, everything lines up. Fortunately clearer heads prevailed, and after frantically manually creating a click track beat-by-beat during the brief break between sessions, we had something the imminently-arriving brass players could play to that matched the string and wind recordings. The theme of transformation is very much well-loved for creatives, and I was really excited to explore what that meant for one of League’s skins. Here, the idea was to freely move between three forms (light, fire, water), using familiar thematic elements. We recorded strings and choir separately at Warner Brothers’ Eastwood Scoring Stage (one of my favorite places on Earth!). In hindsight, this is a piece where I really got to stretch the more emotional part of my writing and went full-on in that direction. The choir section is made up of twelve singers, six altos and six sopranos. It’s hard to believe how big of a sound came out of these amazing few singers. Equally fun to work with is the synth tapestry behind all the orchestral stuff. Remove strings, brass and choir, and there are a lot of 80s music flavors in there. Hopefully one day I get to show some of that stuff! After speaking with the team and seeing some early splash art, I was inspired to have this Legendary VS piece fulfill two ultimate goals: 1) Represent that “quiet before the storm” moment as these two dangerous fighters stare each other down, and 2) have them share a simple motif that evolves over the course of the piece, but is played on two different instruments representing each champion. Yasuo, calling back to his login, is represented by the Shakuhachi. Through some exploration with the music team, we found that automating distorted reverb on the tail of his phrases sounded dark and twisted, which was fitting for Nightbringer Yasuo. As for Dawnbringer Riven, she’s represented by the warmth and strength of an acoustic cello that starts playing relatively reserved, but becomes increasingly less restrained and more passionate over time. That little motif you hear at the beginning of the piece (G, A, *leap down* D) is played by both Riven’s and Yasuo’s instruments at the beginning of the piece; however, the notes following that statement (and the way its harmonized in each section) are quite different from one another. 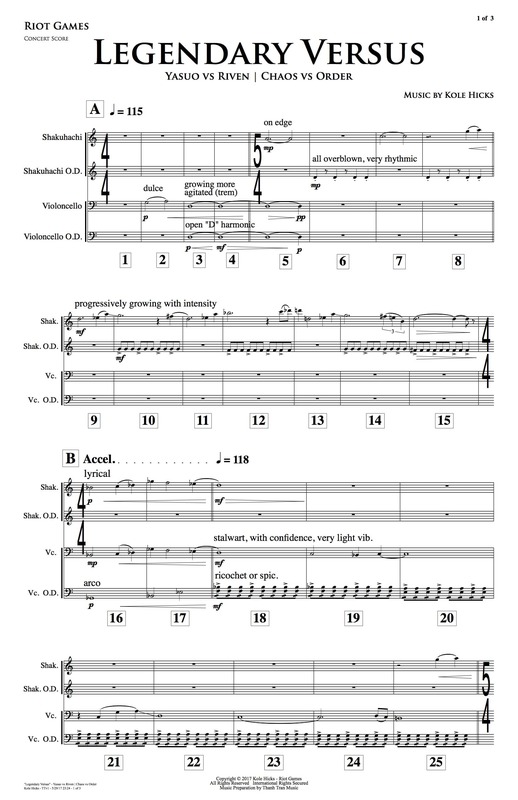 As the piece evolves though, they eventually trade phrases until the very end where their lines merge together. This music relies heavily upon the fantastic performances of each soloist; so I want to give a quick shoutout and hearty thank you to Rachel (Shakuhachi) & Jeness (Cello)! 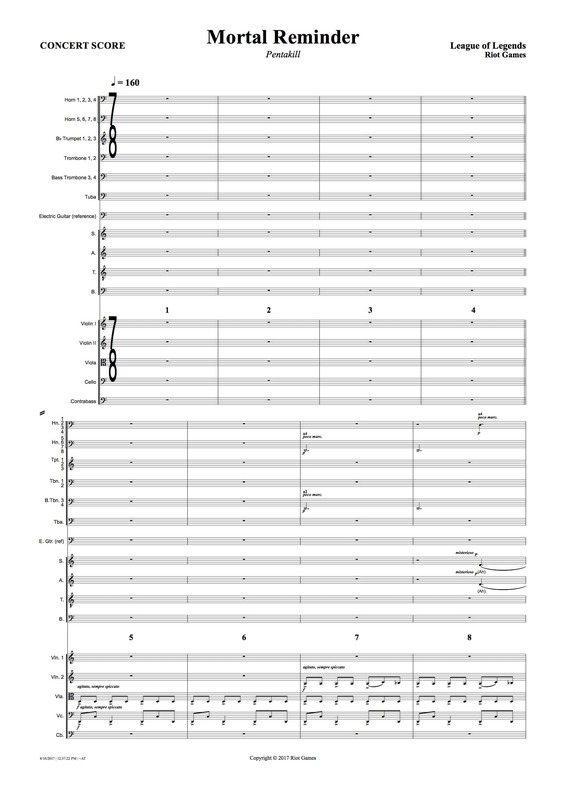 This song was already very far along when I came in to add the orchestral arrangements. The challenge with adding orchestra to metal, as I quickly discovered, is finding a balance between having the orchestra do too much, which can overtake the guitars and rob them of their power, and doing too little and sounding feeble. This is a challenge both for mixing and for orchestration. 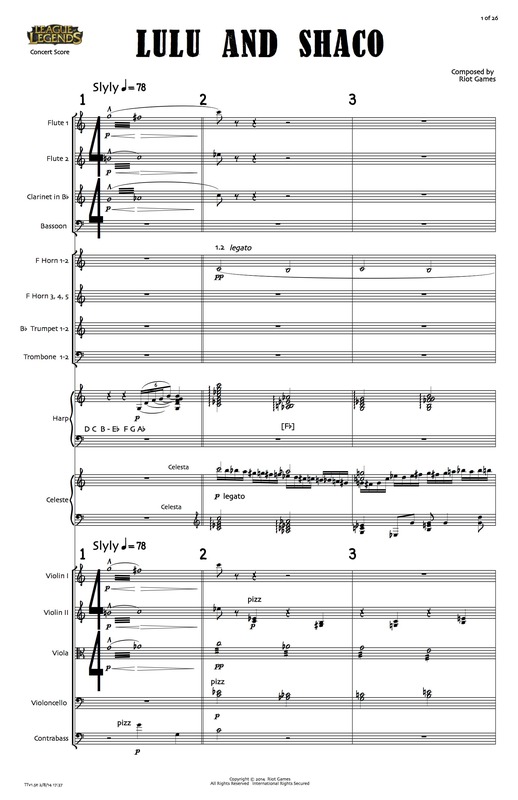 Some of my early versions erred in the “too much orchestra” direction, essentially having the orchestra play throughout the whole song and occasionally getting fancy with added harmonies. It was interesting, but it didn’t sound nearly as raw as the orchestra-free version did. By reserving the orchestra for bigger moments and outbursts, I think we’ve used it more effectively than simply using it because it’s there. 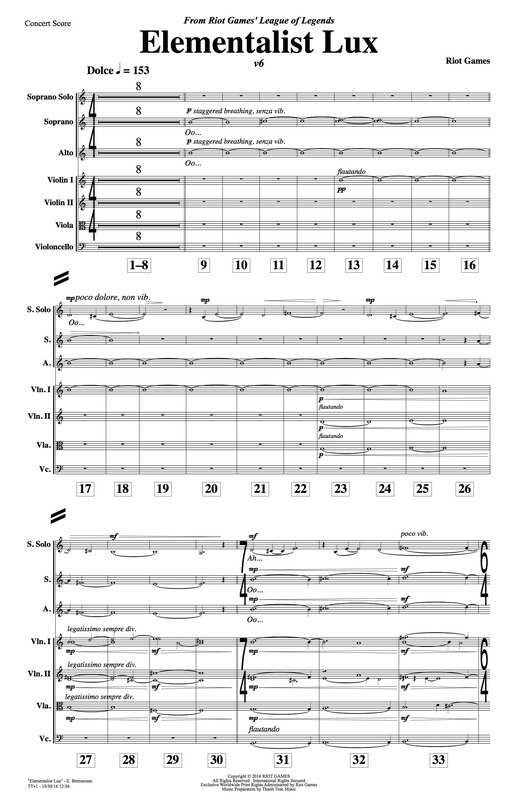 Though the score contains strings, brass, and choir, we only had time to record strings live on this one. 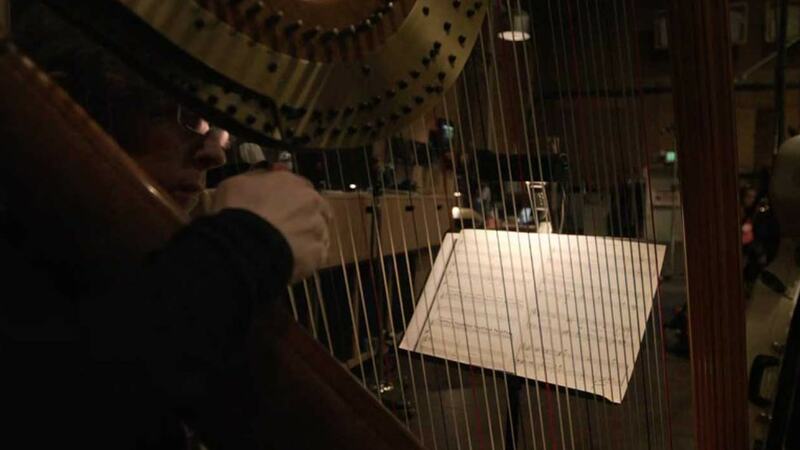 It was piggybacking on the Blade of the Ruined King recording sessions, and that behemoth of a piece used up all of the time available for the brass and choir. Scherzo is a composer on League. His guitar playing may be rusty, but he keeps his pinky in shape by mashing Q on Irelia thousands of times a year.